How many artists can say they were in on the ground floor of a Rock & Roll Hall Of Fame supergroup, is a Grammy nominated Artist, all while inventing a completely original and uncanny sound and, in the ensuing years, building a legendary reputation as one of the most versatile hired guns in the music business? True funkateers know the history. 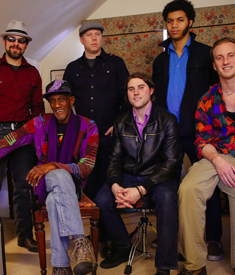 From the fat Minimoog bass lines of “Flash Light” and “One Nation Under A Groove” to the percussive piano runs of “Chocolate City” and “Give Up the Funk,” Bernie Worrell is synonymous with the legacy of Parliament-Funkadelic; in fact, he’s one of the originators of the psychedelic funk sound, having written and co-produced the lion’s share of the music going back to Funkadelic’s formative years, with an eclectic ear for everything from Chopin to the Chi-Lites. The Bernie Worrell Orchestra performs with a core group consisting of two guitarists, one drummer, bass, percussion and, as selectively determined by Bernie: a three piece horn section that performs songs from this album but also songs from Bernie’s vast repertoire.